Bullhorn, the Boston-born recruitment technology giant, has landed in Asia. Having met Bullhorn’s Singapore-based Sales Director last weekend, he had a lot to say about the system as a ‘new wave of recruitment software, ready to disrupt Asia’. So naturally, I thought I would test these claims. The problem with many of the recruitment CRM or ATS software suites available in Singapore is that they’re unintuitive to use and often require more work to maintain than the benefits they provide. I do agree that there is space in this market for a new provider to shake things up with something radically different – but is Bullhorn that vendor? 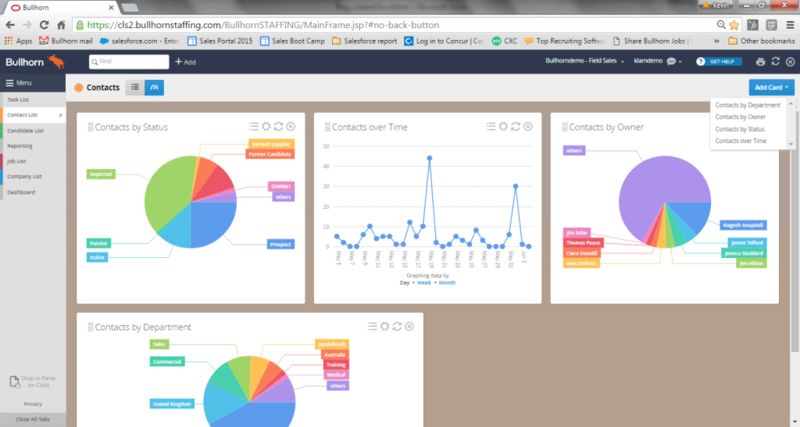 Bullhorn claims to be ‘recruitment software for humans’. Well, I’m a human – so let’s put their claims to the test. Starting on the homepage, I notice a familiar and sleek-looking ‘tech-site’ design with a running video in the background. Do all recruitment technology vendors use the same website developer? The subject of the video seems to be concentrating quite hard, and I hope he’s not finding the system difficult to use! In any case, Bullhorn is a true cloud provider I was required to log in to their secure online portal to use the system. Once inside, I’m greeted by a colourful user interface. The menu bar is located in the top left corner and drops down across the left side of the screen. Personally, I’m used to seeing menu bars and working tabs positioned horizontally across the top of my screen, but this design seems quite intuitive and could grow on me over time. I liked the fact that the menu is colour coded, small touches like this show me that some serious thought has been put into making sure things are easily found, especially once you get to know the system. The menu is also customisable, allowing you to choose what you want to see upon logging in. In my case, I’ve chosen some standard lists and dashboards. Let’s start with the standard workflow buttons. 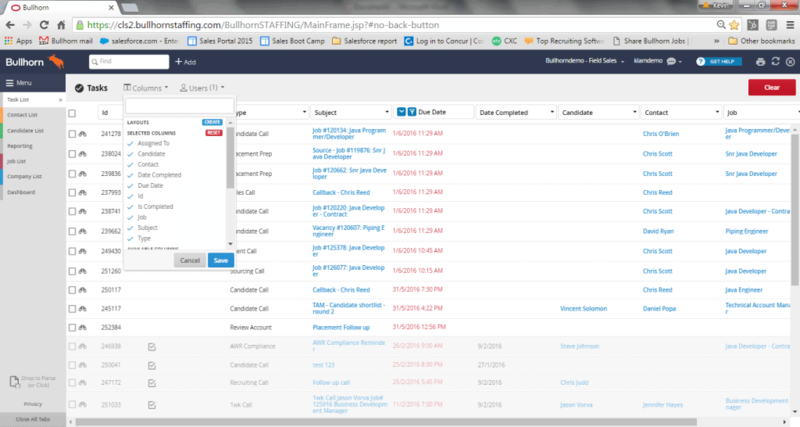 Bullhorn has a ‘quick add’ button located on the top of the screen that actions all of your immediate data entry requests. Here you’re able to add all of your various record types to the system. The second thing you’ll notice is that the bulk of the screen displays your selected information as a list-view. But just how customisable is this listview? One of the biggest limitations I’ve found most recruitment software suites face is limited customisability. These platforms either require to contact the vendor to change things or worse still, they charge money for minor modifications. Fortunately, Bullhorn provides a large variety of field specifications that allow you to format your lists based on any column value. I can filter my lists based on due dates, jobs types, or even completed jobs. A few clicks later and I was able to export these lists directly to excel. The list view is also configurable; I was able to drag and drop columns in whatever order I wanted to see them. Nice! The ‘Contact List’ looks very much the same as the tasks list, except for a little button next to the search box. When you click it, the system switches from a list-view into a configurable dashboard of ‘cards’ view. Dashboards are also customisable to your preference. I can see this coming handy for business development insights and who doesn’t like pretty coloured graphs? Or is that just me…? Next up, the ‘Candidate List’. Once again, this looks very much the same as the other list views except for a few small but powerful features. I was able to add a ‘Score’ column to this list which tells me how highly I’ve rated each candidate; useful for an at-a-glance assessment when time is of the essence. 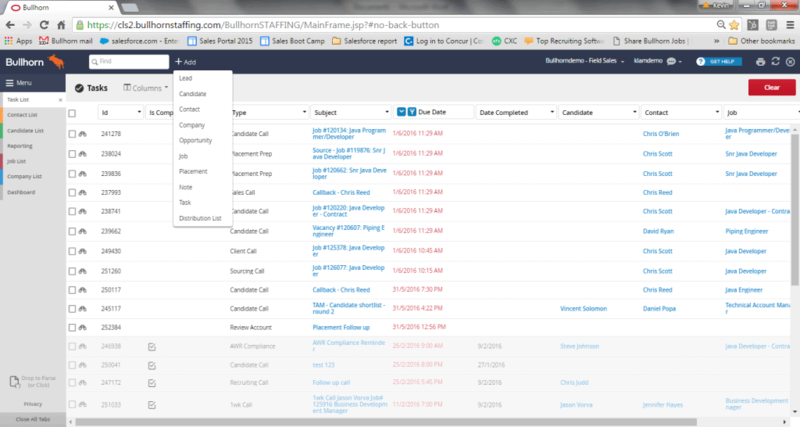 Bullhorn provides you with two ways to search for candidate’s, Basic Search and Boolean Search. I won’t go into too much detail what each of these means, but you’ll be able to conduct granular and customisable searches. I also noticed that these lists now have a ‘binoculars’ button. When you click it, a sliding window pops out with all sorts of useful information. Once again, the ‘Jobs List’ features adjustable and customisable columns like the other lists. 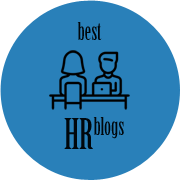 The four best used for managing jobs are web responses, internal submissions, and client submissions and placements. These are great for determining where you are with each job – from submittal to placement. Once again the binocular buttons here open the job to provide greater detail and allow you carry out functions such as the option of adding notes to the record or viewing attached documents. Finally, we come to the last of the list views, the ‘Company List’. Once again, this follows the same rules at the other list views, but once we click on the binoculars, some very cool stuff happens. 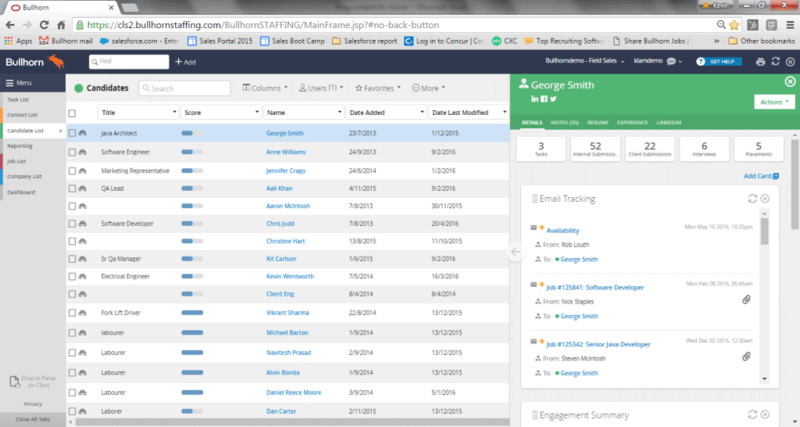 Remember Bullhorn’s automated email and phone tracking is called ‘Bullhorn Pulse’. Despite the cheesy name, it’s quite insightful when observing trends attached to company records. When we expand this view, Bullhorn Pulse shows you customisable cards with data sourced from analysing your communications. It shows you who in your organisation is the most engaged with a given company, who in the other company is most engaged with your agency when the best time to contact these people is, how your conversation activity is tracking over time and even flags emails based on keywords you specify. If a client is becoming dissatisfied and sends an email to anyone in your agency, with the keyword ‘frustrating’ for example, the system will flag it and alert you. Very cool! 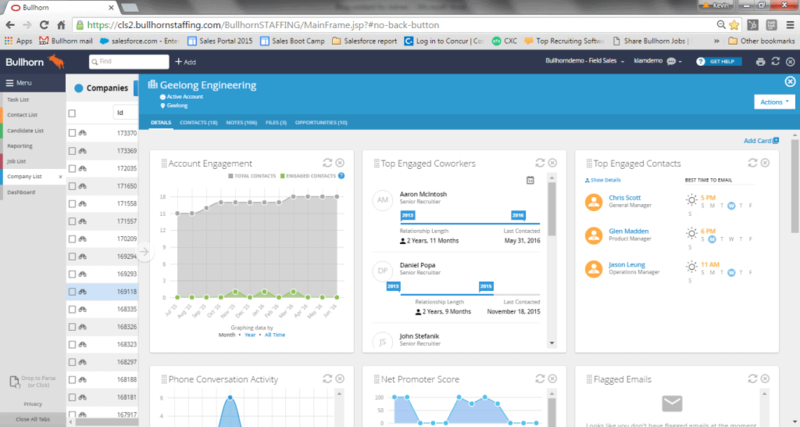 It’s this functionality that separates Bullhorn from the other recruitment CRMs I’ve used. Bullhorn Pulse tracking technology has been patented, which does give Bullhorn a unique feature that none of its competitors can match. The best part about this is that it requires no extra input from the user which is perfect for busy recruiters. Pulse might just be the functionality that makes Bullhorn’s recruitment software worthy of its title ‘Recruitment Software for Humans’. 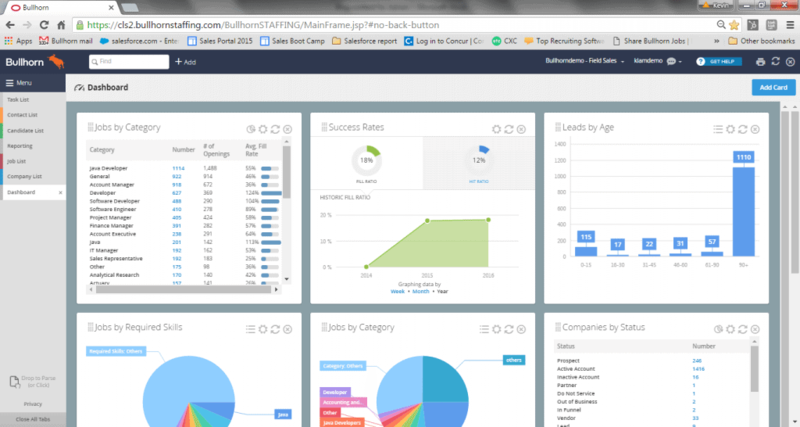 Bullhorn’s Dashboard is a holistic dashboard view which provides complete visibility into recruiter KPIs, revenue, candidate streams and other fancy things. There’s a huge selection of cards to choose from, which is another big tick in my book. Everything in the dashboard is resizable and customizable. I was able to drag and drop cards, arrange them, and flip them from graphs into lists. 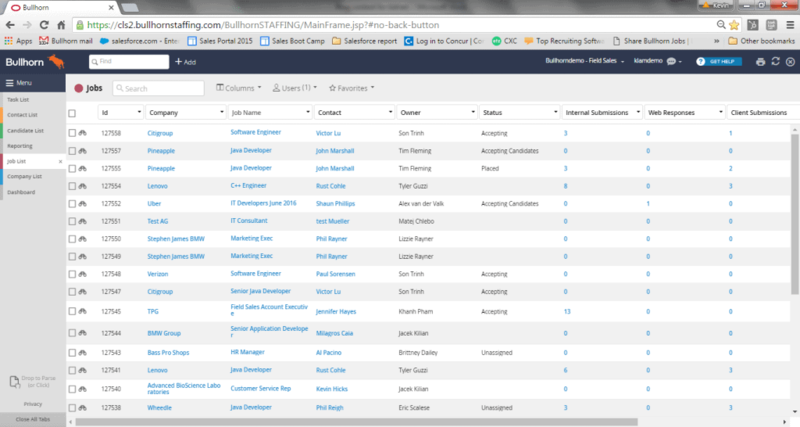 Bullhorn also has some reporting features that give business owners, team leaders and managers visibility into their consultant’s activities. Although these reports are quite good and cover all the internal reports most agencies would need, my one criticism is that system lacks ad-hoc reporting. 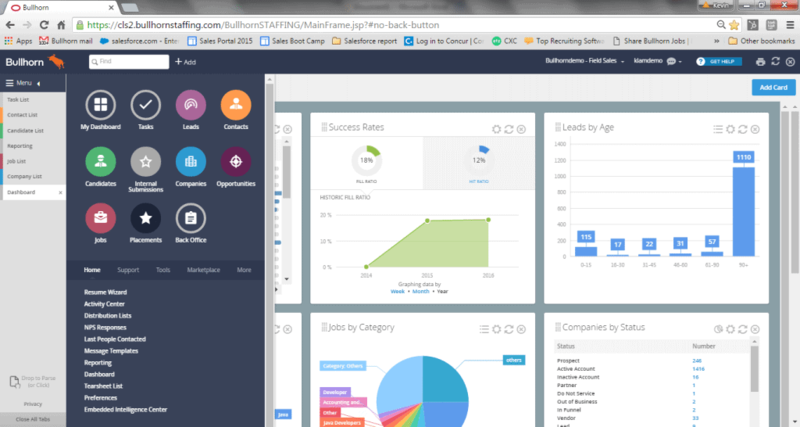 These features are well known to those who have used traditional sales CRMs such as Salesforce. Other recruitment software providers also require this functionality, so this criticism is somewhat half-hearted, but It would have been nice to see. Bullhorn has however informed me that ad-hoc reporting functionality is only months away as of the time of publishing this article. So, is Bullhorn worth all the hype? Well, it’s clear that the system is a product of years of thought and development. It’s packed with subtle workflow features that bring everything together. The UI is pretty and intuitive, and it offers functionality that has never been seen in the Singaporean market. For everything Bullhorn does not provide, it has a third party marketplace of partners that plug into the system handling everything from job distribution to more granular analytics. If you’re just looking for a database that can store candidate information, look somewhere else. 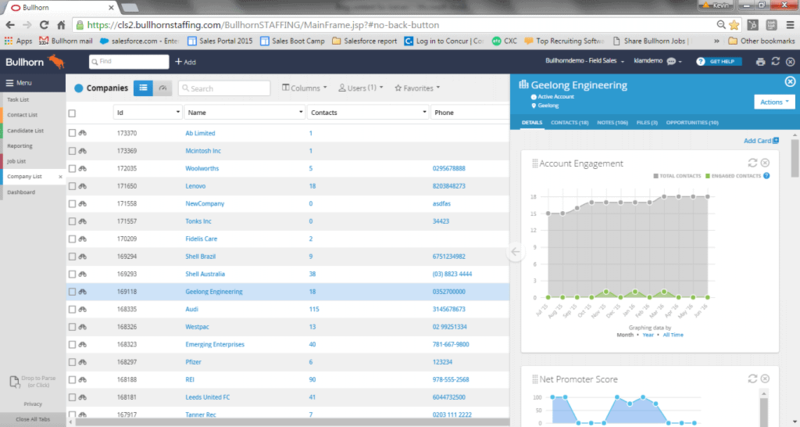 Bullhorn is a recruitment CRM that is pretty much the Rolls-Royce of recruitment CRMs. It comes with a whole lot of bells and whistles to help you ‘build relationships’ and from the first-hand experience, I can see it’s functionality doing just that. Unfortunately, it also comes at a Rolls-Royce-esque price tag, starting at $99 per month for each user and scaling to $185 for the completely unlocked ‘enterprise’ version. For this, you get the complete suite of features and 24/7 support which I found very knowledgeable and friendly. In conclusion, if ‘building customer relationships’ and having the best recruitment technology at your fingertips is important to you, then look no further. Bullhorn provides excellent value for money, especially if you’re an agency with data-heavy recruitment needs.